As individuals, we understand the impact of influenza. But what's it like for doctors, nurses, and their colleagues when trying to keep up with a flu outbreak? A flu outbreak (remember the winter of 2017-18) can be taxing on doctors, nurses, and their colleagues as they tend to worried patients. You’ve read about the toll a flu outbreak can take on those who come down with influenza, and you no doubt are aware of how easily flu germs can spread. But what’s it like for the medical community to keep pace when the number of influenza cases starts escalating? Consider the winter of 2017-18: It was exceptionally active at White Plains Hospital in New York, and as attending physician in the Emergency Department, I can tell you I was working like a madman. My colleagues and I felt the brunt of a particularly harsh flu season, with 20 to 30 or more influenza cases each day in our medium-sized metro-area hospital. All winter long, as the flu outbreak took hold, people came in tired, anxious, weak, stressed, and feverish. They were scared and required significant supportive care. We gave our patients intravenous fluids, medicine to reduce such flu symptoms as fever and body aches, influenza antiviral treatments, and anti-nausea medication. 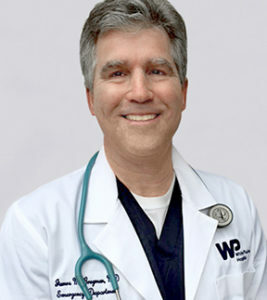 James M. Bregman, MD, is an Emergency Physician at White Plains Hospital in New York. The flu outbreak also meant a heavy expenditure of time and resources. An overloaded medical environment requires clinicians, nurses, technicians, and lab workers as well as custodians, secretaries, orderlies, and others to push the limits of their efforts. It also requires us to work overtime and skip breaks, lunches, and even bathroom stops. As health workers, we felt the weight of the historic increase in flu patients in 2017-18 by suffering more exhaustion, stress, and ill health. There also was a cumulative “emotional wear and tear.” It is often not emphasized enough how frontline people during such epidemics rise to the occasion while taking it on the chin. The public has long had its own fears and stresses about flu season, and things only intensified in the winter of 2017-18. People are inundated with anxiety-provoking information day and night on the airwaves and the Internet, in magazines and newspapers, and via smartphones and conversations with other frightened or sickened individuals. The anxiety over flu symptoms and the threat of germs spreading had people pouring into our ER, scared and in search of cures and protection. They just wanted to feel good again, but wondered if they ever would. They’d even ask if they could die from this flu outbreak. That sort of fear is prone to exaggeration, hearsay, and misunderstood concepts. The media and the health community, of course, try to make people aware of (and well informed about) pressing health issues. Sometimes, however, other factors—sensational stories and outright misinformation, for example—permeate the conversation. We find this to be true about flu outbreaks and about the spread of germs via bacteria, parasites, and pathogens. I write this article to address the concerns of the public and to simplify some of the concepts concerning transmissible illnesses, starting with influenza and also getting into other respiratory infections affecting our population. Influenza goes back in history to antiquity, as described in many texts from the Far East and in Western culture. For thousands of years, it has regularly infected human populations throughout the world. Influenza thrives in concentrated populations, so as civilization progressed into settlements and cities, the conditions for infectious diseases within human populations were optimized. Until relatively recently, the biologic and genetic mechanisms of influenza transmission were poorly understood. The modern germ theory was only recently proposed—just over 100 years ago—and demonstrated by Louis Pasteur and Robert Koch, along with others, to the point where we now have a true understanding of germ transmission. Earlier theories of illnesses included flawed models such as “spontaneous generation” of germs, miasmas, and evil humors. These theories combined religion and magic with early rudimentary science and did not see infectious illness as the invasion of living organisms into a host’s body. We now understand that germs are composed of living organisms or particles we classify as bacteria, protozoa, viruses, and other microbes. Influenza, for example, is a small virus that is now well studied and fairly well understood in terms of its structure and life cycle. Influenza is an RNA (ribonucleic acid) virus, which means it’s made up of nucleic acid (the genetic code of the virus) surrounded by capsule of protein and sugar-like molecules. Two of the main proteins that are not RNA are neuraminidase and hemagglutinin. They allow the virus to attach, penetrate, and start the machinery for more virus production in the hijacked human cell—typically the cells in the throat, nose, eyes, mouth and other areas. How Do We Get Influenza? Influenza is accidentally inhaled and begins an incubation process in the mucous membranes of the unlucky host over one to three days. A patient typically will experience early flu symptoms: a mild sore throat, body aches, headache pain, and chills that usually start abruptly. Patients often say they were well one minute and experiencing flu symptoms the next. Along with those classic symptoms, you may feel backache, leg pains, extreme fatigue, nausea, eye pain, abdominal pain, and other types of pain or tenderness. The elderly often report only extreme fatigue and weakness, or being unable to rise from bed or unable to walk. For someone who has a high fever along with nausea or reduced appetite, it’s easy to become quickly dehydrated, further exacerbating the fatigue. In this way, a negative cycle can start—one that will worsen symptoms even further, requiring the sick to seek a bed or medical attention. In most cases we treat in the Emergency Department, patients require fluid hydration by way of intravenous infusions. 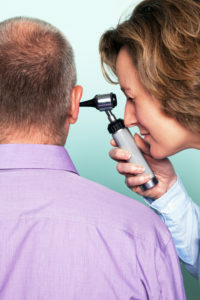 This treatment alone is probably the most common and effective therapy that we undertake in the hospital setting. By keeping influenza patients well-hydrated and controlling their fever, we find that patients not only feel better, typically, but that their immune systems are maximized, allowing them to start to fight off the viral infection. The good news is that the majority of flu victims will quickly get well. Sensible rest—often meaning an extended stay in bed (two to three days, maybe more) allows patients to feel better—no further fevers, improved appetite, more energy, and a reduction in body aches and cough. For more on how to deal with influenza symptoms, see our posts Best Flu Treatments and 11 Best Flu Remedies Backed by Scientific Studies. So ultimately, influenza imposes, on most of us, a week or more of lost time—no working, recreating, or exercising. A prolonged period of fatigue, sometimes weeks or even several months, is not uncommon. Obviously, it’s important to take the necessary steps to get better and also to set realistic expectations as to your recovery time and normal functioning. In a rare number of individuals, influenza can lead to severe, life-threatening illness, causing significant morbidity and mortality. The seasonal death toll of influenza certainly has a devastating impact on those individual affected and their families and friends. The 2017-18 flu outbreak had an overall death rate of only one to five deaths per 100,000 patients. However, if we look only at cases affecting young children (less than 1 year of age) or the elderly (upwards of 74 years old), the percentage of deaths goes up significantly and can be as high as 20 to 30 or more deaths per 100,000 ill.
Flu-related deaths tend to strike the already ill or terminal, but that doesn’t diminish the suffering that these patients endure and the heartbreak and loss that their families endure. Occasionally, influenza will cause rapid decompensation and death in a perfectly healthy or robust individual. (Decompensation refers to “the failure of an organ—especially the liver or heart—to compensate for the functional overload resulting from disease,” according to Oxford Dictionaries.) This was true for a number of cases in the New York area and in the Southeast in 2017-18 and also in one highly publicized case of a previously healthy 14-year-old female in Ventura County. In all of these cases, it wasn’t entirely understood how such an aggressive and rapid decompensation could occur. In the infamous influenza pandemic of 1918-1919 (also called “the Spanish Flu”), there was a much higher percentage of mortalities in young, healthy individuals. The death rate during that pandemic was as high as 3 to 4 percent or more and resulted in the deaths of more than 600,000 Americans and an estimated 40 to 50 million people worldwide. In India alone, the Spanish Flu killed approximately 17 million people. In Iran, the same pandemic killed up to 10 percent of the population. These figures put in perspective the scale and devastating potential of a flu outbreak that spirals into a pandemic. Is it partly by luck that 2017-18 strain of the flu, Influenza A H3N2, happens not to be as devastating as prior outbreaks and pandemics. Or, have we made a significant impact in terms of early treatment, health, and outbreak containment? 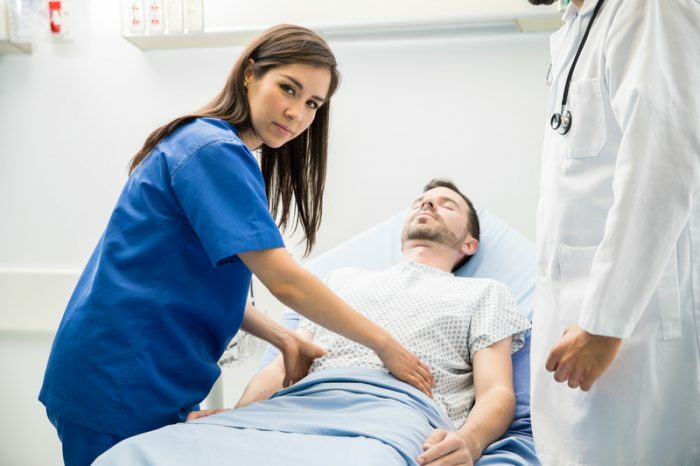 We also know how better to support and treat sick individuals who are having complications associated with pneumonia, dehydration, kidney failure, and other problems, allowing them to recover from serious infection more reliably. We now have, at our disposal, anti-influenza medications (neuraminidase inhibitors) that can slow or delay the progress of the influenza virus in sick patients. Like vaccinations, these drugs are not 100 percent effective. However, there’s significant data showing the efficacy of these drugs. They may be particularly important in the more sick and higher-risk patients exposed to influenza. Overall, we have a multi-pronged approach to treating flu, and we have a scientific understanding or the biology and epidemiology of its behavior. DURING FLU OUTBREAK, ARE MASKS AND GLOVES NECESSARY? One extremely important behavior that the public can undertake to reduce the risks during a flu outbreak is appropriate hygiene. By washing our hands when interacting in public and protecting ourselves from individuals producing droplets, we can drastically reduce our risk. Appropriate hygiene also may entail the availability of masks, if necessary, and even the occasional use of gloves around known, sick individuals. The purpose of this recommendation is not to create neurotics out of us to the point where we’re afraid to interact with others or go out in public, but rather to educate to undertake some simple behaviors that will protect us all. I believe carrying a paper medical mask, a bottle of hand sanitizer, and a pair of gloves for specific circumstances is a reasonable approach when we’re moving about in public during a flu outbreak. I’m not saying we need to wear a mask or protective equipment at all times; doing so is unnecessary. But I can’t stress enough the importance of hand-washing and of having sheer awareness of your surroundings. And it’s wise to change up your “greetings” habits during peak flu season. An elbow bump or fist bump, a wave, or a simple “hello” is better than shaking hands with everyone. When in close proximity with someone persistently coughing, donning your mask is not a bad idea and should not be offensive to the potential infected individual. By adhering to these simple behaviors in a reliable and reasonable way, the public can seriously protect itself and even have a positive impact on the rate of transmission during flu outbreaks. And by understanding basic facts surrounding influenza virus and infection, we can react sensibly and allay much of our fear and anxiety over unseen bugs, pathogens, and germs in general. For most infectious illness, many of the principles of protecting ourselves are universal. By embracing these behaviors, we can make an impact on other infectious disease and improve health across the board. abdominal pain, anxiety, appetite, backache, bacteria, best flu remedies, children, dehydration, early flu symptoms, extreme fatigue, eye pain, flu, flu remedies, germs, headache pain, health, hydration, infection, kidney failure, more energy, mortality, pain, pains, pneumonia, protein, recovery, report, sore throat, stress, sugar, tired, viral infection, virus.